Oh, this is a lifesaver for entertaining. Your friends won't even know it's good for them. In addition to making this to serve with crudités, I also like to eat it as a side dish and call it spinach-artichoke mash. So versatile, it is. Put all these things except the cayenne into a food processor and turn it on for a few seconds. It doesn’t take long at all. Add cayenne or crushed red pepper to taste. Then put into an oven-friendly dish and bake at 375 degrees until hot. And actually, you can eat it cold—whatever you want, kiddo. Serve with cut veggies or as a side dish. 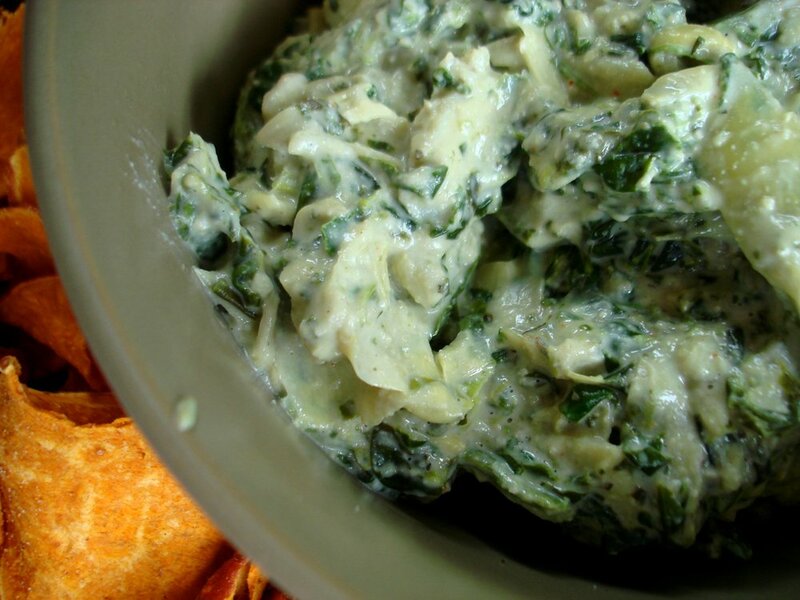 This dip is pretty creamy, but if you like a chunky texture, chop the artichokes by hand and mix everything up by hand. If you don't have mayo or nut butter on hand, you can make your own (cashews, processed until creamy). Feel free to adjust the ratios so that you have 4 T of creamy ingredients total. My favorite ratio is half almond butter and half mayo (that’s why the recipe is written that way), but I often make it without nut butter and it’s great.